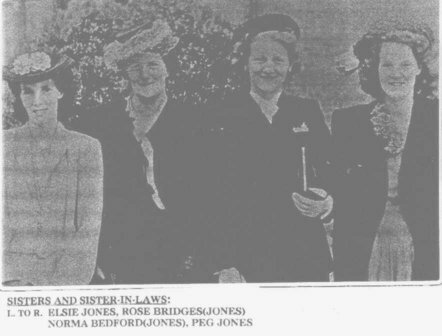 The following is an edited version of the document "Thomas Jones and Ann Agnew - 'We weren't lagged here.'" researched and written by Margaret Babbini (nee Jones), Great-great granddaughter of Thomas and Ann. The original text of which can be found here on our homepage as "Thomas & Ann - Part 1 - 5. All are .pdf files. Remarks: Lost 2 front teeth. Jones. Once received 6 months (goal). 19 March 1845 - 10 days? 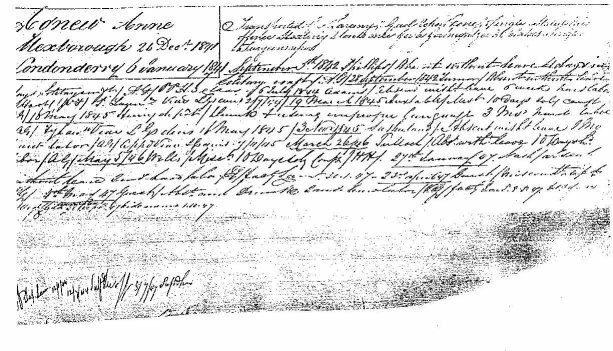 28 September 1847 - delivered an illegitimate child. 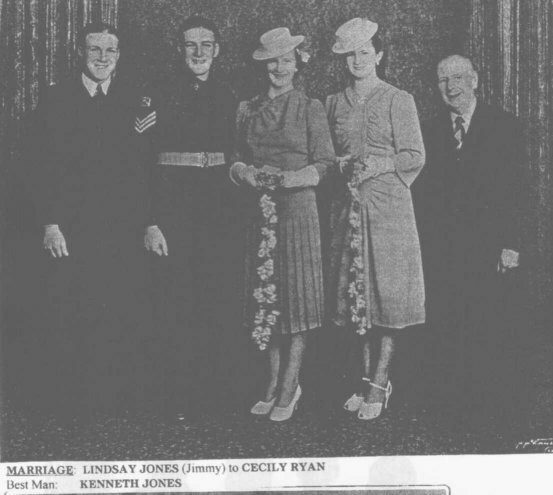 Father: Thomas Jones (most likely). Born Launceston Female Factory. (Note 1: For delivering a child women convicts were sentenced to 6 months goal (men not charged). 16 children were born at the Launceston Women's gaol between July and December 1847. Thomas aged 27, labourer, married Ann aged 24, spinster. On 16 November 1851, the steamer "Shamrock" left Launceston, bound for Melbourne, Victoria. Among the passengers were, Thomas, Ann, Thomas (jnr) and William. On the morning of 21 June 1852, at around 10a.m., Thomas, Ann and the children left Buninyong for Ballarat. 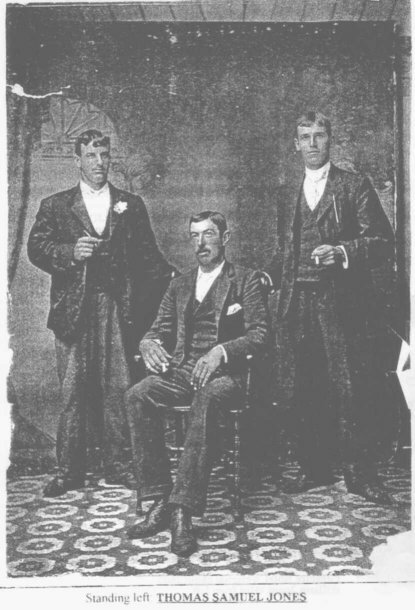 They were accompanied by James Murray (a friend of Thomas') and James Conaghty. They had borrowed or hired two horses and carts from a man called John Seach and may have been setting off with hopes for success at the goldfields of Ballarat. At some stage during the journey, the cart Thomas was driving overturned and Thomas received fatal injuries (either by a blow to the head or suffocation) from the vehicle rolling on top of him. His eldest son, Thomas jnr, was with him at the time of the accident and was apparently uninjured after it. 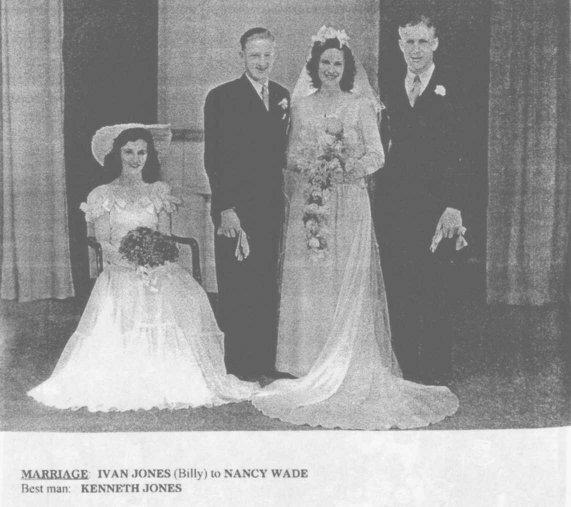 "I am the wife of the deceased Thomas Jones. I left Bunninyong this morning the 21st June 1852. My husband was driving one cart and I was walking behind the second on with my little boy. When we proceeded about five miles my husband took the child with him into the cart and went on leaving me behind. I never seen him alive again. Murray and myself and Jim were in company, when we came up to the spot where the cart turned over. My husband was lying with his face upon the ground and the little boy was crying at his side. I believe my husband was killed by the pressure of the cart upon him. My husband had taken something to drink before breakfast at Bunninyong." Ann and her surviving children endured a further 4 years alone during the Victorian gold rush far from any family support in an area (Fiery Creek) where living conditions were harsh, people were desperate and a climate of extreme temperatures. At some stage, Ann met John McGuire. They married around 1856, where Ann changed her first name to Mary and she became Mary McGuire (this is fairly common, even today, to be known as "X", but be called "Y", I will however, still call her Ann for the remainder of this narrative). 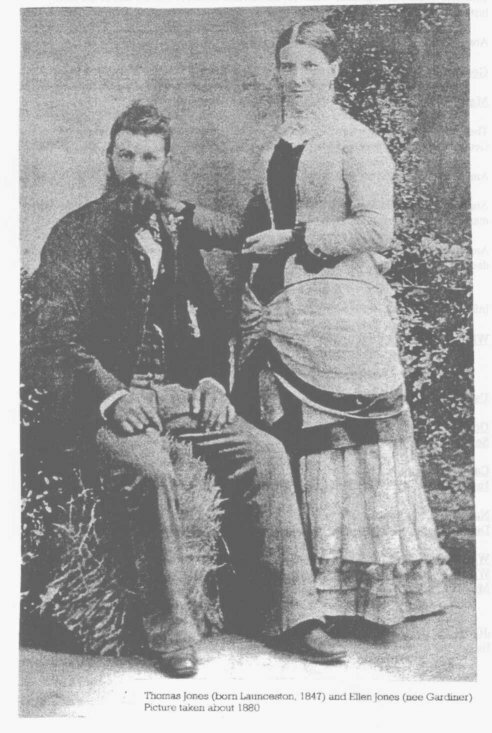 John and Ann had two children; George, born 1856 at Waterloo, Victoria and Mary, born 1859 at Charlton, Victoria. 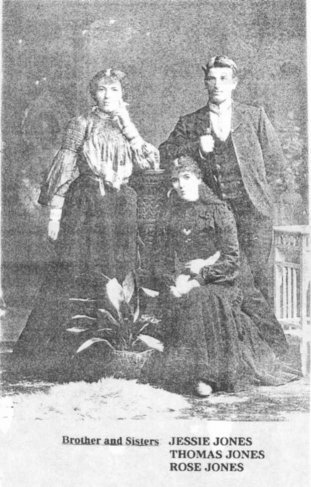 Thomas (son of Thomas (dec) and Ann) and Ellen (daughter of Samuel (dec) and Janet) were married on 11 April 1876 at Langi Kal Kal, Victoria at the house of Janet Gardiner by the Presbyterian Minister of Beaufort, Victoria, Alexander Adam. "A link with the past. In the presence of a family gathering of thirty or more, a birthday cake with 88 lighted candles was placed before Mr Thos. 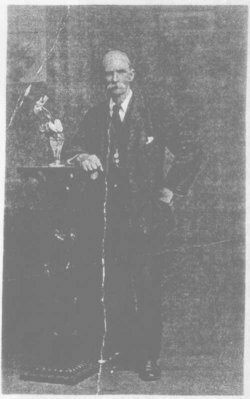 Jones yesterday afternoon at the residence of his son Mr. W. Jones, at the corner of Macarthur and Havelock Streets, Ballarat. 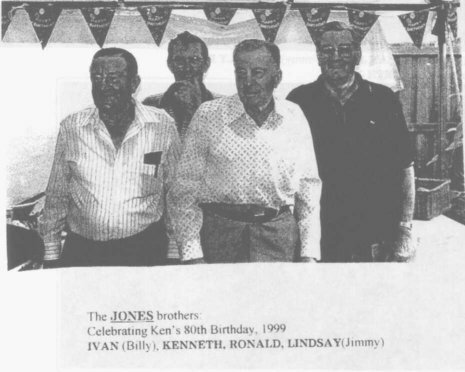 Mr Jones senior was born on the bank of the Tamar River in Tasmania in 1847, and there cannot be many older born Australians, and having lived at Waterloo, near Beaufort, for some 80 years he must be hard to beat as an oldest resident. He had fifteen children, of whom eight sons and two daughters are living, and there are forty four grandchildren and sixteen great-grandchildren alive. He is still in good health, with a wonderful memory, and only a few months ago was engaged in mining. The gold discoveries drew him with his parents across the straits to Ballarat in 1851 or 1852, so that he saw and remembers this city at its most picturesque period. Gold was then extraordinarily abundant and after every flood, he says, was to be seen along the Yarrowee. In those days the diggers sank circular holes, not oblong ones as is the universal practice today. But though the old folks were a wonderful lot even they were not pick and shovel experts. However, there was gold lying about, and one lady hit upon an ingenious plan for gleaning it. She made sugar lollies, and used to give them to the small folk to collect gold in bottles for her - a ruse that one supposed would hardly answer now. Mr. Jones was climbing up Black Hill - then an attractive place with nice trees and pretty flowers, with another boy one afternoon, when his companion drew his attention to a fire away in the town. It was Bentley's Hotel in flames, the precursor of the Eureka affair. He remembers the latter also, and a rattle of musketry there aroused him from sleep at his home on Black Hill. He was there after the fight and says he saw big holes in the bodies of some of slain caused by the swords of the troopers. 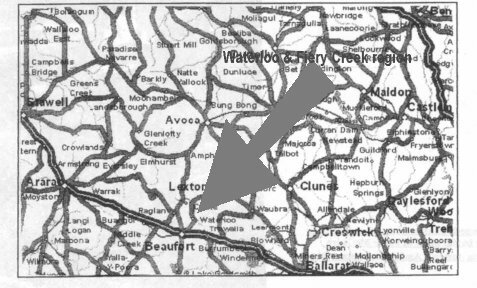 His father was killed in an accident soon after he came to Ballarat, and in 1855 he went to Waterloo for the Fiery Creek Rush, where he settled down, getting a living by mining and all classes of bush work. 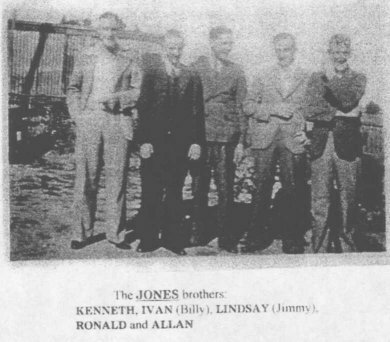 Mr. Jones is a fine type of the old pioneer, and one can well understand how in the hands of such as he - Australia was established on the sound foundation of which it falls to the present and succeeding generations to build." Ellen Sarah Jane Jones (nee Gardiner) died on 6 April 1964, in Melbourne. 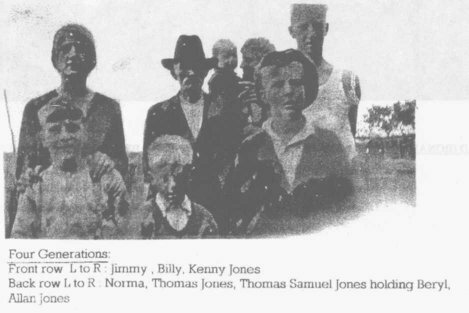 Thomas Samuel Jones III died on 1 July 1965. 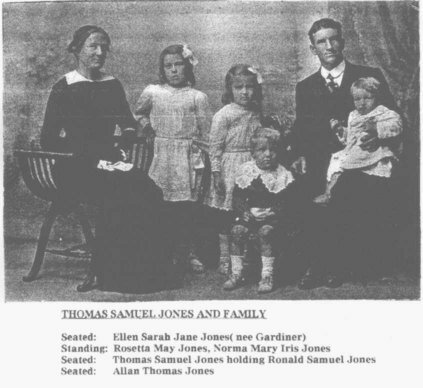 Following are pictures of Thomas Samuel III and Ellen Sarah Jane's children.